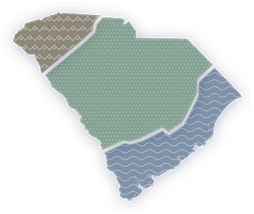 South Carolina's lush forests, beautiful coastline and rolling hills are chock-full of scenic campgrounds and RV parks. Find the perfect place to set up camp on your next South Carolina adventure. Discover a place to call home in scenic South Carolina. Whether you're pitching a tent with an oceanfront view or planning an RV adventure to the rolling hills of the Midlands, South Carolina's campgrounds and RV parks are Just Right for your next camping trip. Escape to Sesquicentennial State Park, a popular green getaway just outside of Columbia, SC. Get the family together for a capital city outdoor experience and enjoy countless campsites that are perfect for tents and RVs. Head to Hickory Knob State Resort Park for a rustic retreat with modern-day conveniences. Some of the most scenic campsites in South Carolina are reserved for tent camping only. Check out these 10 great spots to pitch a tent from the mountains to the Midlands to the coast. Cherry Hill in Mountain Rest is a rustic paradise. Plan your next camping adventure in the SC Upstate to enjoy scenic views and unforgettable outdoor experiences.